Get the “look and feel” of a brand new property for a fraction of the cost with pressure washing. We use all biodegradable solutions and a variety of tips and water pressures so you can feel secure that your property, pets, and landscaping are in good hands. We have more than 12 years experience with all types of building materials, from vinyl, stucco, aluminum, and even delicate cedar. Don’t forget to freshen driveways, patios, and sidewalks as well. We use a specialized flat-work machine for these surfaces as opposed to tradition wand pressure washing for a more even, streak free finish. 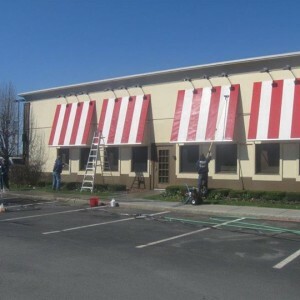 We also offer awning cleaning services. Regular cleaning will add years to the beauty and integrity of your awning. Whether woven or vinyl, we can remove heavy soils and streaking from your awning. We heavily rinse the awning then apply brushed and deep cleansing solutions to preserve the original state. We recommend awning protector for your woven fabrics and stain repellent that prevents soils and mold from entering the fabric weave. We can always count on Tom’s professionalism and impeccable work ethic. He believes in quality and is always willing to go the extra mile to exceed his customers’ expectations. Aside from window cleaning and pressure washing, we have also hired Tom to do interior and exterior painting. His attention detail led to flawless results.